CCLR, DTSC and US EPA will present an intensive two-day redevelopment workshop geared towards the unique characteristics of redevelopment in California. JUST ANNOUNCED! DTSC will provide an overview of its upcoming Vapor Intrusion (VI) guidance updates at the California Land Recycling Conference. Be part of the conversation as DTSC VI experts and authors/contributors discuss the guidance publicly for the first time to a brownfields-focused audience. Those attending this year may get in touch with us prior to the conference to arrange for a face-to-face meeting time. Contact us via email here or call the main Los Angeles office to speak with Justin Conaway: 213.458.0494. Learn more about Terra-Petra’s Brownfield Services. 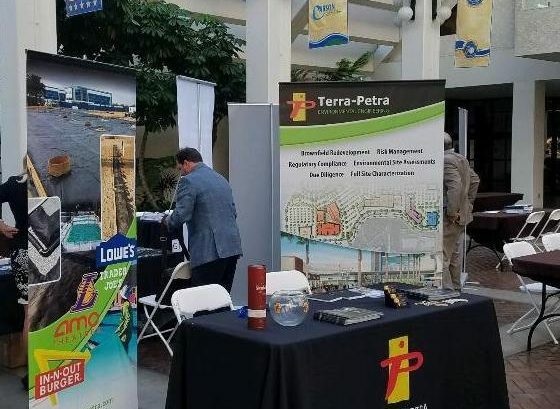 Terra-Petra's VP/GM Justin Conaway recently attended the “Introduction to Brownfield Redevelopment” seminar with Terra-Petra's Nate Shamosh. The seminar (held in Oakland, California on February 11, 2015) was sponsored by the Center for Creative Land Recycling (CCLR). Advertised as being for “individuals new-and not so new-to brownfield redevelopment," the workshop provided an interactive series of presentations, panels, and case studies. Both Justin and Nate found that the CCLR seminar did a great job of living up to its billing. There was a diverse group of professionals from many different levels in the redevelopment process including governing agencies, developers, environmental engineers and environmental attorneys in attendence. According to Justin Conaway: "In the environmental construction and engineering industry there is always something new to learn and we acquired valuable information by attending this seminar. CCLR did a great job as the sponsor and host of this event. The speakers were very knowledgeable and experienced. They all provided great insight into the brownfields management process. The seminar was well attended and the audience was engaged throughout the event."